Advantages: Available in the grain range P1500, P2000 and P3000; color coded grains, the disc pad absorbs water on the surface to polish and distributes the pressure; smooth finish and less scratch depth; less effort is needed at work; washable, reusable and waterproof; use hand for difficult-to-reach surfaces. 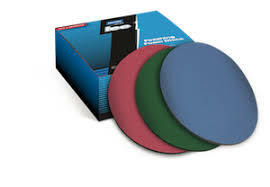 New improved Norton Ice discs are ideal for quicker polishing when on-site repairs. The new "open eye" technology absorbs water for equal pressure distribution. Norton Ice also provides good grinding with a smooth surface and a lower scratch depth.